Three days has passed since I came back from Japan. Yet, I am definitely in a state of the post-holiday blues and feeling rather sad and withdrawn. The time I spent with my mum was simply wonderful and I am full of admiration for her resilience and wisdom. She is truly an amazing individual and I am very lucky to have her as my mum. 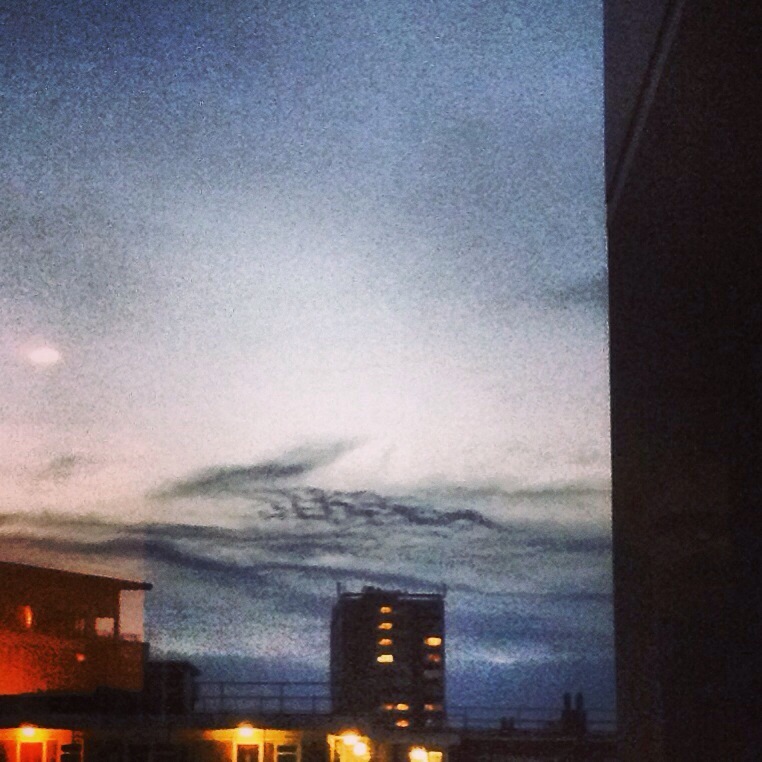 Don’t you agree that it looks like a dragon? I wish if I were with mum and pointing at the sky with her. I have the same blues when I come back to Tokyo from my home country. It always take some days to get back into your life, schedule, etc. がんばって!! Oh, thank you very much for your kind words. Mum & I had a quality time together after 2 years of not being together physically (been skyping every other day though) and didn’t want it to end ever. I am very lucky to have 2 families on 2 different parts on the earth to care about me. But it also gives me such an anguish everytime I have to leave them behind in order to be with the other ones. So glad you’ve started knitting again. Doing something creative is very therapeutic. Could I just ask a boring question – did you find on your trip home that the price for nice things was more expensive than it used to be? There has been so much chat in the UK press about exchange rates, mentioning the Yen, and I wondered if it felt different to you. Yes it certainly is and it is all very complicated for non specialists, but I think it is extremely valuable to learn from people who have first hand experience. Thanks for your reply. I hope your little dog didn’t miss you too much – they sometimes really pine and even stop eating their food. I hope he is well and I bet he was really pleased to have you back home! I hope my observation was any help. I used to have more faith in Japanese products but the shopping experience this time in Japan was a mixed one. The expensive items were still dependable and reliable. However, the cheap ones were not durable and very throw-away. A decades long recession have definitely affected the consumers’ perception about pricing and expectation for products. And sadly, it has made genuine manufacturers’ life very difficult. Your information about the state of the Japanese economy and prices was very useful. Most of the English people I’ve spoken to recently all assumed that everything would be much more expensive. I am glad Mr.B has settled back into his normal routine. Hope the jet-lag doesn’t last too. And, thanks again for the info.